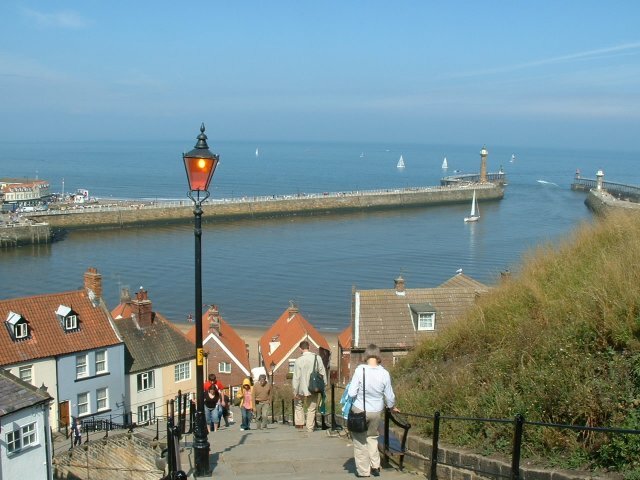 This weekend saw the Whitby folk week take place. 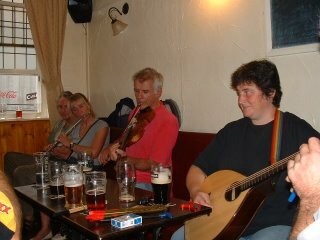 As one of my hobbies is playing the bodhran (pronounced BOW-ron), I have been going to the festival for years. 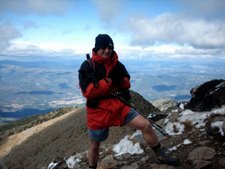 It's a great week, although I usually only stay for four days as by then I am played out and ready for a rest! If the weather is good, the streets as well as the pubs are alive with music. Not just 'finger in yer ear' type stuff, but all sorts of folk music and dance. Another of my hobbies is walking, so I also get to walk the cliffs by the sea. 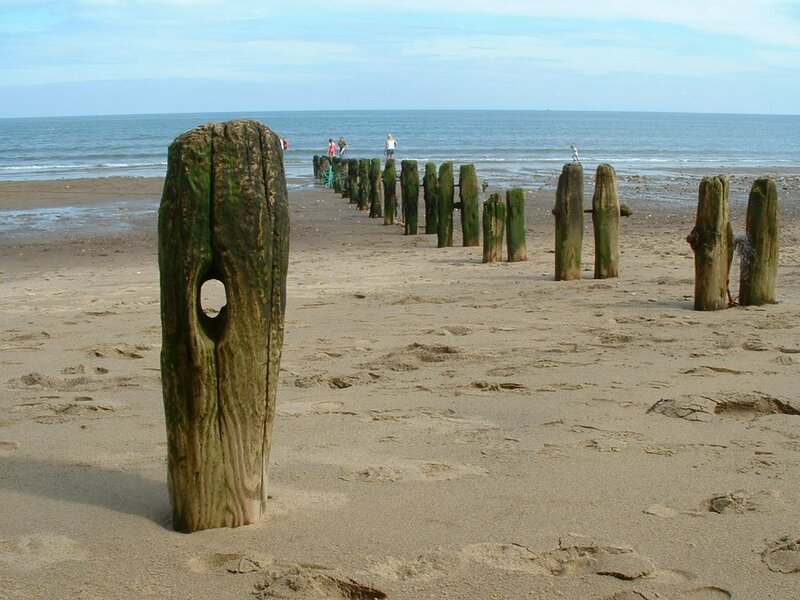 I LOVE the sea, and wish I lived nearer to it. 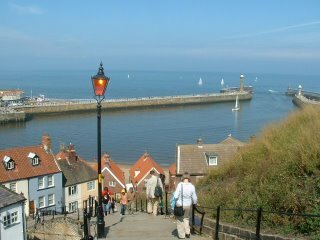 The view of the harbour, from the 99 steps up to the abbey, is a classic. Here it is, taken from about a third of the way up the steps. The weather forecast was for mostly rain and showers, but the whole weekend was like you see here, apart from one or two little squalls. Once you get ensconced in a pub, the mood and music take over and it's all for one - one for all! These impromptu sessions are my favourite. There are LOTS of organised concerts, with luminaries from the folk music world, but this is where the bare bones of the tradition are to be found. Sometimes you can't get into the pubs, especially if word has got around that one of the greats is at that session, which often happens. One of the things I also look forward to is eating fish and chips, REAL fish and chips - the sort you only find at a fishing port. 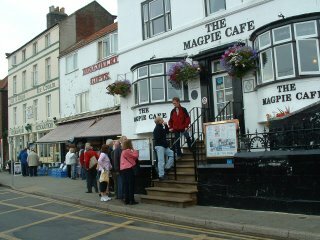 The Mecca is, of course, the famous Magpie cafe, opposite the fish dock. Some of our greatest chefs have eaten here and declared it the best! I had to go and check for myself, and after doing that many years ago, and becoming a convert, I now visit at least once, but often more, each time I go, Judging by the constant queues at most times of the year, many, many others have the same view as me. This, naturally, leads to queuing outside - something I and many others are QUITE prepared to do. If it rains, staff come out with Magpie umbrellas so you won't get too wet! The food, staff and ambience just CAN'T be beat, and I have been served by my favourite waitress Maureen, for as long as I've been going. A fly has appeared in the ointment though, as some of the neighbours (from hell) of the Magpie have complained to the council. I mean - we CAN'T have people being more successful than them - CAN we?? I am amazed and incensed that the council even BOTHERED to respond, but respond they HAVE and, instead of actually BACKING the success of the Magpie, decided to make their life difficult by insisting on trying to make people queue ACROSS the road! I have written to the council concerned at; highways.northyorkshire@northyorks.gov.uk about this ridiculous situation. They should be applauding the Magpie for all the business and visitors they bring into the town, NOT getting on their case! Here is the daft situation - see the 'pedestrian waiting area' across the road (and SEE how a passing car could present danger to people crossing the road to eat???). 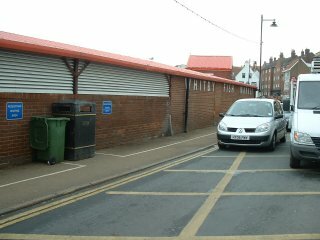 ONLY the council would make you queue at the side of rubbish bins before going to eat - CHARMING! The place I love to stay is called 'Holmleigh' This place is run by a brick ***house called Kev, and his lovely wife Carol. Kev is a gentle giant (as long as you don't cross him), and is PERFECT f'ront of house'. NOTHING is too much trouble for them, and if you act like an adult, there are no rules, just come, enjoy, make yourself at home. The house is kept lovely, and the breakfast is one of the best. Here are the happy couple - aren't they lovely? So, that's it for another year, folk music wise, at Whitby, but my love of the place means it won't be long before I'm back - I need a 'fix' at regular intervals! I can not believe that you have been to Whitby again and been so close and you have not let me know! Anyway whats this that you have another favourite waitress!!!???!! !